After three enjoyable nights in Olifants‘ spectacularly situated unit 14, we had only a third of our December holiday in the Kruger National Park left. Happily that didn’t depress our mood too much, as we would be spending the last three nights in our beloved Shingwedzi Rest Camp. The final stretch to Shingwedzi delivered special sightings of yet more mating lions, unfortunately spoiled by an idiot who got out of his car to try and get a better photo, as well as a beautiful old tusker. Whenever we stay at Shingwedzi, there’s only one road we take for our first afternoon drive – a slow drive along the S50 gravel road that follows the river, offering ample opportunity to appreciate the diverse and abundant wildlife that congregate on the river bank. That’s exactly where we pointed the Jazz’s nose after checking into our cottage, number 29, donated by the Wildlife Society in the 1950’s. Around Shingwedzi the best viewing is usually along the watercourses, which is why we decided on the S56-route along the Mphongolo River for our first morning drive from Shingwedzi. That afternoon, Red Rocks and Tshange viewpoints to the southwest of camp beckoned. One last guided nightdrive in search of nocturnal wildlife delivered much better sightings than the windy nightdrive we undertook from Lower Sabie a few days earlier. 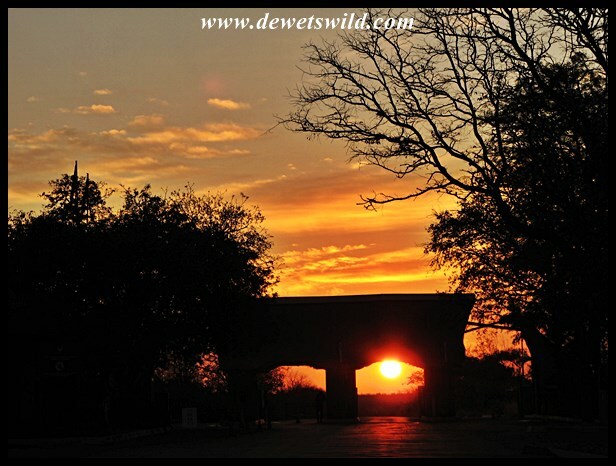 By the time the sun rose over the horizon on our last full day in the Park, we were already travelling along the S50-route enjoying the Shingwedzi River’s abundant wildlife and awesome scenery before returning to camp and a late breakfast. Shingwedzi was nice and quiet in the early morning, as most guests were still out on the road searching for game, giving us an excellent opportunity to amble through the camp. With such a wide variety of bird and animal life around Shingwedzi it was a rather difficult decision which area we’d drive to on our final afternoon. In the end we opted for the Mphongolo Loop (S56) again, and what a great choice that was! We’ve already shown you pictures of the waterhole meeting between large herds of elephants and buffaloes we witnessed that day. Dodging a couple more elephant and buffalo herds along the way, navigating through several herds of antelope and scanning the landscape for new species of birds to add to our ticklist, we were thrilled that our afternoon was concluded with a leopard lying in wait at a small waterhole. And so, our time at Kruger National Park has come to an end, for this visit at least as, of course, the next trip has already been booked. All that remained was to drive down to Phalaborwa Gate, from where Pretoria lay a hot six-hour drive away. Those trunks are so dexterous! Great photos! I can’t believe why a wildebeast would roll in dung… Unless it was like mud to him? Hmm… Sounds like something to look up! Such an amazing variety of wild life and birds, thank goodness for the digital camera, you must have a large memory card and so many images. Thank you for sharing them. Thanks for visiting Shingwedzi with us, Pommepal. Isn’t it wonderful how digital photography has opened the world to us all!? Wat ‘n voorreg om ‘n visvalk te sien en dan so ‘n mooi foto ook te neem!Die res van jou foto’s is net so mooi,Dries.Lekker gekuier saam met julle. Ons was uit ons vel uit van opgewondenheid om die visvalk daar oor die Shingwedzi te sien, Dina! Hy het in sirkels om-en-om oor die poel gevlieg, wat kans gegee het om n goeie foto te kon kry. Thank you Samuel! Kudus are magnificent antelope for sure, but for me the sable is my favourite. That’s a lot of animals to love! Kruger seems to have it all Lyle, you’ll have a wonderful time there. Sulke pragtige foto’s laat my sommer verlang na die Kruger Wildtuin vakansies!! Die Wildtuin bly darem maar n lekker plek Aletta, julle moet bietjie plan maak! Baie dankie vir die gawe kommentaar Tannie Frannie, ons waardeer dit voorwaar! I continue to love your photos! And you see a lot of those out in the bush! Oh my, it must be hilarious seeing the horses try to roll uphill, Janet! Thanks for vsiting Shingwedzi with us! Thanks a lot Drake, that’s very kind of you! As long as the photos give a good idea of Shingwedzi’s allure, I would have been happy!